No way, no how, should this idiot get anywhere near the nuclear codes of the United States. This is serious business folks. We had an idiot for president the past eight years, 80% or 90% of us likely agree on that now. But Sarah Palin? Idiot times two. Times four. Times a hundred. In the history of the United States, including Dan Quayle and Geraldine Ferraro, there's never been a more unqualified candidate for the highest office in the world. These are serious times. They call for serious, smart, experienced leaders. Sarah Palin must be dumped. Now. 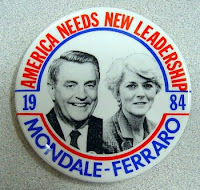 Or John McCain should be voted down in Mondale-like-fashion. Here's the latest blast of self-assured ignorance from Palin. The world is laughing at us folks. At the same time, they're scared. God help us all. You're watching America spin dangerously out of control now. "It's very important when you consider even national security issues with Russia as Putin rears his head and comes into the air space of the United States of America, where — where do they go? It's Alaska. It's just right over the border. It is — from Alaska that we send those out to make sure that an eye is being kept on this very powerful nation, Russia, because they are right there. They are right next to ... to our state"
LOL ... I can't believe the dems are still imploding over Sarah Palin!!! If she were that dumb and if the ticket really had no chance like you say, you'd be ignoring her just like we are ignoring Biden. I guess I'll make another batch of popcorn and kick back to watch the next episide of Palin Derangement Syndrome. He will look like a genius and a prophet while Obama sat there with his d*ck in his hand voting "present." Then the night before election day, run an ad with Obama saying "My Muslim faith" and snuff him out for good. It's a gawd damn celebrity contest now. Enjoy the ride down America! Most americans can identify with her, they are just like her. That is why america if fucked. Get with the programs. We are a nation that has idiots and educated people. The idiots are for McCain. Fact. I think Obama will win by a landslide. Race will play a part in McCains votes. I take it from your garbled post that you are for McCain, then? I, like Frank, feel safer knowing that Sarah Palin stands defiantly between me and the evil Russian devils who are conspiring - at this very moment - to invade and pillage my home. Truly disturbing answers especially when you watch her try to tack a bunch of disjointed talking points together to constuct a sentence. Brainless. As bad as the beauty contestant who answered the question about Americans and maps. Pretty clear now that McCain's motive was to prevent the vp debate from happening. Let's put a little perspective on this, Keith. Joe Biden is no better. Biden thinks that Roosevelt was president when the stock market crashed in 1929. Oh yeah, he thought that FDR was on television during the stock market crash, too. I think that it was 1939 when television came on the scene - not 1929. He's a real ringer, that Joe Biden. I can see him trying to handle a crisis, and using history as a precedent. That would be a laugher. And, that's what the Democrats have to offer? sexism will play a part in obama's votes, already has in his win over clinton. "where do they go? It's Alaska. It's just right over the border. " They should put up a border fence in Alsaka to keep all those illegal Russians out. They are worse than the Mexicans. But she's like us, the majority of the country. She's white trash! She ain't got no high-falootin' education from some fancy-pants elite university! I'm votin fer her cause she's good people! Oh my, Frank the republican has lost it. Do you people really believe that MCcain pursued more regulation? He didn't even vote 64% of the time in the Senate over the last two years. Poor brainstems. They still hold out hope that the republicans will take back power and give them all their money back in taxes.